If you head for the most easterly point in Sussex, you will come to Rye. With its steep, cobbled streets lined with pubs, restaurants and hotels it is a town that attracts a considerable number of tourists. There is much to see: Ypres Tower, the surviving part of Rye castle; Lamb House, the home of Henry James at the turn of the 20th century; the view across Romney Marsh to the east and Brede Valley to the west from the tower of St. Mary’s church atop the hill. As one of the Cinque Ports, it has a long association with both high and low born seafarers: providing ships for the royal fleet and the cover of inns with secret tunnels for smugglers, particularly the notorious Hawkhurst Gang; but its greatest attraction can be found in the High Street. Sitting opposite the junction with Lion Street, the Old Grammar School is a three-storey Jacobean building that dwarfs The Mariners tearoom and Byzantium jewellers either side of it. Its imposing Renaissance facade is impossible to ignore amongst Boots the chemist and the Nat West bank. Dating from the early 17th century, it was built by Sir Thomas Peacocke as a school for boys ‘for the better of education and breeding of youth in good literature’. It ceased to be a school in the early years of the 20th century but the founder’s name lived on at the nearby Thomas Peacocke Community College; until recently. A name change has seen the local comprehensive rebranded as the pithy but bland, Rye College. 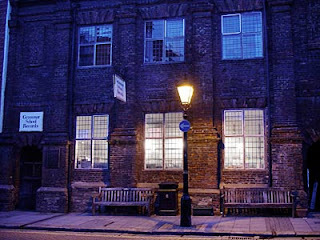 However, it is not just the beauty of the building that makes the Old Grammar School such an attraction. For the past twenty years it has been the home of an independent record shop. Rock, jazz, folk, blues and reggae; easy listening, world music, classical, musicals and soundtracks: this vast generic range makes Grammar School Records probably the best independent in East Sussex. Specialising in second-hand vinyl, the massive stock of LPs and 7-inch singles makes stepping through the brick arch doorway into the high-windowed body of the shop a breath-taking experience for any vinyl sentimentalist. On my last visit, my on-going search to replace vinyl that I had lost custody of in the darker recesses of time saw me pick up a copy of The Pogues’ 1984 debut ‘Red Roses For Me’ and The Waterboys’ 1985 album ‘This is the Sea’. But I also came away with a copy of ‘All Good Stuff, Lady!’ by the risqué Brighton music hall comedian Max Miller. I could spend hours flicking through the racks of albums here; the enjoyment is not just finding what you’re looking for but stumbling across what you didn’t know you needed. We got married opposite this beautiful building. Loving the blog - beautifully written and it's got soul.